Well, I actually received the album from Amazon Japan last Thursday, which I thought it would only arrive by the weekend from their initial estimates. And since I had the time to listen to the songs in Prism over the weekend I thought I might as well do a small review about the album to serve as a rough guide for those of you who may be wondering to get the album now that it has been made available. Note 1: For those wondering why I am late in posting this that’s because I am waiting to post this together with the song videos for Prism from YouTube. 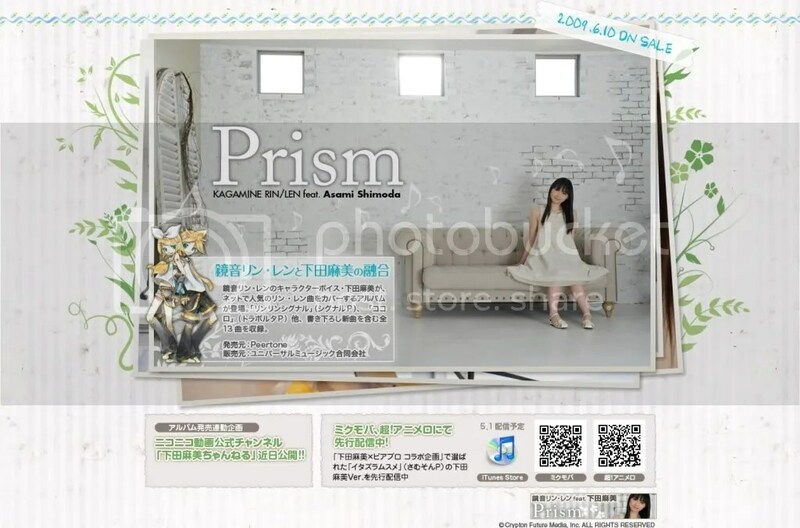 For those of you still wondering about getting the Kagamine Rin/Len cover album by Asami Shimoda (Asapon), you can now go over to the Prism homepage to listen to short versions of the songs in the album by clicking on the image above. From the song samples provided I would be looking forward to more of Kokoro, Meltdown (Roshin Yukai) and Rin Rin Signal, which are some of my favorite Kagamine Rin and Len songs. Too bad Proof Of Life didn’t make it into the album since it’s actually part of a two episode series by Kagamine Rin and Len, with Proof Of Life by Kagamine Rin and Soundless Voice by Kagamine Len, for more info about these two songs you can view one of my Vocaloid music posts explaining about these two songs. It seems to me that quite a number of nice Rin/Len songs are also sad songs as well, which I will be introducing a couple more later this weekend. And if you can understand Japanese then you can visit Asapon’s Nico Nico Douga channel to view all the videos about Prism which includes the making of the album and interviews with the song creators and Asami Shimoda herself. This album will be released on the 10th of this month and retails at 3,000 yen, which you can still pre-order at Amazon Japan (ships internationally). 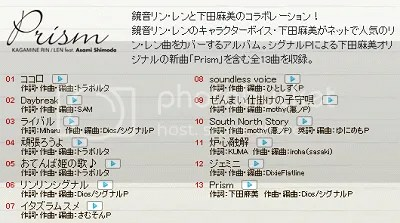 Well, I just happen to be browsing on Amazon Japan when I saw that the Prism album by Asami Shimoda, which will be released on June 10th, has finally updated the song list to reveal all 13 songs that will be included in the album and here are the songs as listed below, songs in bold indicates that the song wasn’t revealed previously. I pre-ordered it instantly. I’m personally really excited to see Daybreak and Gemini in the tracklist. And as I’ve said before, I’m really looking forward to see Asapon singing Meltdown and Kokoro. Also, the song Itazura Musume by samsonP, which Asami Shimoda has done a cover of, the short version has been uploaded to YouTube earlier on and you can view it after the break. Note: Post and song list updated with more information as of May 26th 09. Asami Shimoda’s Latest Album [Prism] Out On June 10th!